The compact SUV may be just 166.6 inches long, but it’s still a Jeep. 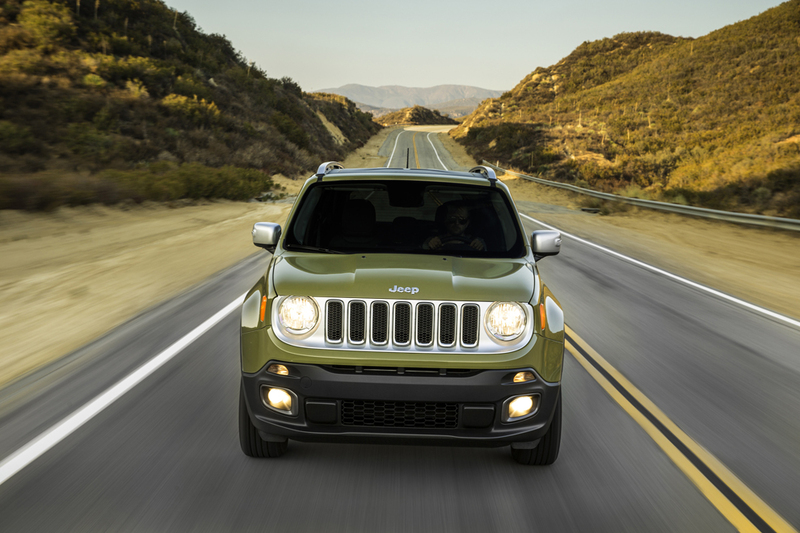 The 2015 Jeep Renegade may be short in stature, but it has plenty of character. You could almost hear Jeep loyalists let out a collective groan last year when the brand unveiled the Renegade to join the parade of tiny sport utility vehicles crowding America’s roads. But Jeep wants to make a buck as much as the next auto brand, and subcompact SUVs are all the rage right now. Besides, the Renegade is still a Jeep. It has the trademark seven-slat grille and includes some signature Jeep touches inside like mud-splatter graphics on the dashboard dials. “Since 1941” is etched under the center console to remind you that although the Renegade may be the family baby, it’s part of a long-running legacy. More important, the four-wheel-drive Trailhawk model is king of the mountain when it comes to off-road performance. It’s the most capable in the mini ute segment. Jeep was not about to cede that claim. With Jeep being part of the Fiat Chrysler group, the Renegade is built in Melfi, Italy, and shares a factory, platform and components with the Fiat 500X. Just 166.6 inches long, from the front, with its black-accented grille, it looks like a mischievous tyke ready to romp in mud and sand. Two-tone alloys and black roof rails sharpen the look. Square tail lights are stamped with the Jeep emblem. The Renegade, which comes in a variety of loud colors, also features lift-out roof panels that spell Wrangler-style adventure. Short overhangs in both front and rear give the Renegade a stubby look but serve to enhance its climbing skills. Clearly, however, most drivers of the vehicle will only climb neighborhood hills and speed bumps as they head to the mall or run errands around town. They’ll find the Renegade a blast to drive and easy to park, but the short wheelbase, at 101.2 inches, means a slightly choppy ride. Jeep serves up two engines, both with four cylinders, for the Renegade, which oddly, are comparable in terms of power. A 1.4-liter turbocharged engine is standard with the base Sport and Latitude trims and produces 160 horsepower and 184 pound-feet of torque. It comes with a six-speed manual transmission that is smooth and fun to drive, but as there’s little room in the vehicle’s footwell, you might want to avoid wearing the floppy sandals or work boats when behind the wheel. A nine-speed automatic transmission is optional with that engine and standard on the other, a 2.4-liter that puts out 180 horses and 175 pound-feet of torque. That’s a few more horses but less torque than the 1.4 turbo. Fortunately, there’s plenty of pull across the power band. The Renegade feels sprightly on the road, with a decent jump from the get-go. The 1.4 runs smoothly and has a sporty feel. Not too surprising given the stats above, the vehicle’s zero to 60 mph time is about 8.8 seconds with either engine. When it comes to gas mileage, 1.4-liter engine gets 24 mpg in the city and 31 mpg on the highway. The 2.4-liter engine gets 21 mpg in the city and 29 on the highway. Electric-assisted steering offers good feedback, and the Renegade feels well-controlled on corners. That’s especially true on the standard front-wheel-drive versions, which sit two inches lower than the 4×4. A full-time all-wheel-drive system is available on all four trim levels. In addition to offering an automatic setting, a four-mode control adjusts the system for enhanced performance in mud, sand or snow. On the highway, the system disengages the rear wheels and reverts to front-wheel-drive for better fuel economy. The Renegade is an inch wider than the Jeep Cherokee, and that means surprising shoulder and hip room for its class, especially for passengers in front. Backseat passengers are a little more cramped for legroom, but there is sufficient space for three back there. The cargo area has 18.5 cubic feet of space, but put the rear seats down, and the cargo area opens up to a more generous 50.8 cubic feet. In the Limited trim, there is room to stow the removable sunroof panels under the cargo floor. The Renegade’s interior has a rugged Jeep-like feel. Fit and finish is clean, and the materials look and feel good, even if there is some plastic about. Dials and instruments are well placed and easy to see and use. The vehicle can be loaded with Jeep’s Uconnect infotainment system, which remains among the best in the business. The intuitive system offers quick response and bright graphics on a 6.5-inch touchscreen. Users can even apply their own smartphone apps to the system. For safety, the Renegade has no shortage of air bags, including front, driver-knee and full-length side-curtain bags. A rearview camera is standard on all but the base Sport. Optional tech-safety packages include blind-spot monitor with cross-traffic alert, lane departure and lane-keep system, and frontal collision warning. Despite its steel wheels and manual transmission, the Sport trim comes decently equipped, with a fixed, dual sunroof, automatic headlights, power windows and locks, and a telescoping steering wheel. The Latitude adds alloy wheels, fog lights and roof rails plus the Uconnect control interface. The Limited gets 18-inch wheels, an improved driver-information display and leather-trimmed seats with eight-way power for the driver. The top-line four-wheel-drive Trailhawk goes off-road with all-terrain tires, raised suspension, skid plates, tow hooks and a full-size spare tire. Cloth upholstery is accented with red stitching. But let’s face it: Few will buy the Renegade for its off-road prowess. It’s nice to have it, but Renegade shoppers are probably more interested in its price and fuel economy. And, of course, that mischievous yet charming character. The Chrysler 300 has always been one of those cars that turns heads. It’s big, brash and stands out from the crowd but, until now, it has suffered from a bit of an identity crisis, mainly because so many people referred to it as the poor man’s Bentley or, laughingly, Rolls-Royce. I guess it is easy to see why it was branded an imitation of the British luxury cars, and you can even buy a body kit to make the exterior resemblance even more striking. Look on the internet and you will find pictures of a 300 which has been made to look like a Rolls-Royce Phantom. A step too far, me thinks. The Bentley thing wasn’t entirely unwelcome because people loved the idea of having a large sedan which looked a bit like the British icon – and that is as close to the real thing as it gets – at a price they could afford and so it sold well. This is all very well but the 300 is too good a car to be branded a cheap imitation of a vehicle most of us will never be able to afford, and now Chrysler have produced the newly styled S model which is going some considerable way to ditching the Bentley clone image and reclaiming its own identity as a good value car which offers comfort, striking looks and impressive performance. The 300S looks great, especially in red with those fabulous 20-inch gun-metal grey wheels. The bigger deep black mesh grille and lower front facia, stylish LED headlight clusters with black bezel surrounds, sculptured bonnet and muscular rear with new facia incorporating the chrome tipped exhausts, all contribute to create an aggressive ‘gangster car’ persona but it is not without some refinement. Chrysler have upped their game with the interior with lovely Nappa leather seats and nicely done soft touch materials and metals, and a clock, and I have to say it is really impressive. The newly designed and configurable instrument cluster is particularly cool, especially at night, when it has a nice blue glow, and the steering wheel is finished in leather with contrast stitching. Our test drive car had black leather with white stitching but there are plenty of bespoke options available to choose from. The updated Uconnect infotainment system and sat-nav accessed via an 8.4-inch touchscreen on the centre of the dash and there is also a rear parking camera, blind-spot monitoring, rear cross-path detection, adaptive cruise control and forward collision warning with active braking, amongst the safety features. There is also a very impressive BeatsAudio sound system. The one thing that is missing is a gear-lever as the transmission is controlled by a dial selector, or Rotary E-shift to give it its proper name, on the centre console, much like the ones used by Jaguar. There are paddle-shifts on the steering wheel to give you more direct involvement. A large car like this which weighs almost two tons needs a big engine and although there is a V6 version of the 300 our S model had the far more agreeable 5.7-litre V8 Hemi which packs 363bhp and torque of 534nm, putting the power down to the rear wheels via a new eight-speed Torque Flite automatic gearbox. Hit the ignition button and you are treated to an extremely pleasing deep rumble. Put pedal to metal and it won’t exactly blow you away but it is plenty fast enough and will get you from 0-100kmh in under six seconds. The car is best driven in sport mode which provides better acceleration and quicker gear changes and the handling is exceptional for a car this large. Push it through corners at speed and you might expect noticeable body roll, but there is hardly any at all. It has performance tuned suspension and chassis which ensures a comfortable ride and a new, more precise power-steering system helps with its agility. Apart from its aesthetics, the great thing about this 300S is its versatility; it is the perfect family car for those looking for something with a bit of American attitude and it ticks all the boxes as a very cool sporty sedan which will burn rubber, if you are into that sort of thing. Oh, and it doesn’t look much like a Bentley. It’s a very impressive car in its own right. How old are you, guy? No, not what it says on your birth certificate. How about your psycho-social age? If your Facebook quiz says there’s a lot of boy in your man, have we got the truck for you. 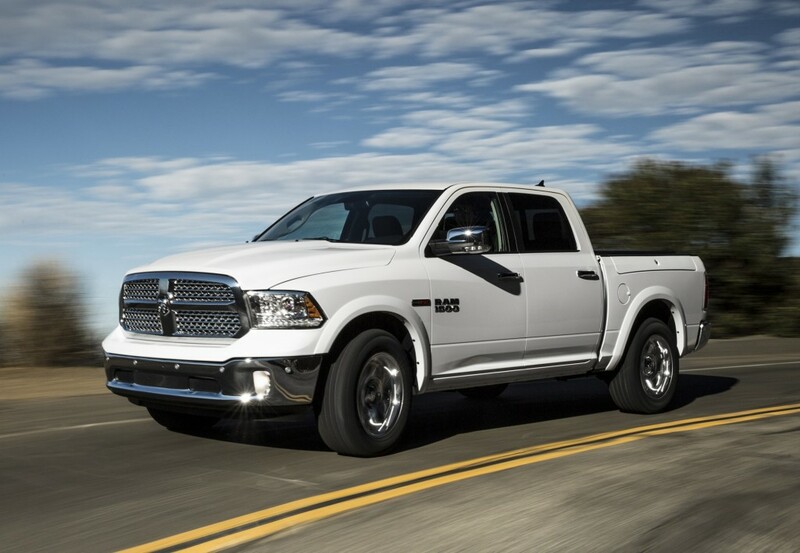 We’re signing you up for the 2015 Ram 1500 Rebel. By man-boy, we’re not talking juvenile, just enough orneriness to not be, well, boring. Because Ram Rebel. Hey, they named it, not us. It looks the part. The Ram Rebel has a tough guy look that’s purely intentional, with tow hooks sticking through a contrasting color front pan, a bulging hood and a new Sam Elliot mustache grille design. The crosshairs grille was menacing, but the laconic cowboy is what every truck driver would like to be. If he can’t be, well, maybe his truck can. Indeed, even Ram says that the Rebel “makes a statement.” Although the luxury themed Ram 1500 Laramie has the same grille for 2016 (a bright crosshair grille for 2015), the Rebel has a one-inch ride height increase. There’s air suspension for even more ride height—with a lowered position for easier entrance and exit. It comes standard with big 33-inch tires, fender flares to cover the sizier rubber, skid plates for the front suspension and transfer case, and the manly of manly feature, tow hooks. Ram says the 10.3-inch ground clearance is best in class. We didn’t go around and measure, but whether it is—and what’s included in its class—that’s still a lot. There’s certainly no wonder the truck’s brand. It’s writ large—18 inches across—on the grille, and on the tailgate, it’s three feet wide. That’s a foot wide for R, a foot wide for A, and a foot wide for M. Our test 2015 Ram Rebel was finished in Granite Crystal Metallic Clear Coat. Don’t dare call it gray. Ram interior designers machoed up the cabin, with a two-tone color scheme officially “black” and “red” though it looked more gray and metallic wine, with the red on assorted trim bits, such as the trim around the dash ventilation ports and on the door panels, red contrast stitching on the steering wheel, and red around the base and sides of the seat. Perhaps the most eye-catching interior feature is the embossing on the seat bottoms and backs with a tread pattern that looked like the seat had been run over by off-road tires. It’s something that people seeing it for the first time snag someone else to point out it out for the first time. Interior designers everywhere else, eat your hearts out. Ditto, the truck drops from the off-road mod to normal at road speeds, and down to aero on the highway, but you’d never know from driving it. The 2015 Ram Rebel with the 5.7-liter Hemi V-8 and its 395 horsepower and 410 lb-ft of torque, it makes all the right performance truck noises and in rear-wheel drive mode makes the knobby tires scrabble for traction. Despite the substantial curb weight, the Rebel is rambunctious and doesn’t have trouble merging on the freeway. But then, those big tires, as neat they look and effective as they surely would be off-road, are heavy, and that translates into sidewall flex over bumps, and that comes off as a rougher ride than smaller tires would have. And the pattern makes highway whine, subdued, but still there. Speaking of the freeway, we have it on good authority that if you set the cruise control at 75 mph, you’ll get 19 mpg on the Interstate. But not in your jurisdiction, Mr. Officer. More conservative speeds might actually return the official 21 mpg EPA highway estimate. We enjoyed watching the light that said when the truck was running on four-cylinders—the 5.7-liter Hemi has cylinder shutdown mode—and it will do it on the highway, too. Overall, we matched the city mileage estimate of 15 mpg in mixed highway and local driving, the latter on hilly roads that we’ve found are hard on fuel economy numbers. The 2015 Ram Rebel, however, doesn’t care how old you are. Like the Chevrolet Silverado Midnight, it appeals to your kid, as well as your inner kid. There are cheaper ways to traverse job sites, or dirt roads to secret fishing places, less expensive than the $52,375 as our tester’s window sticker (see the specifications page) for equipment and pricing as we drove it. But if you wanted a pickup truck when you were chronicalogically, this is the one you can have now that you can afford it. Cargo box capacity: 50.3 cu. ft. Published: Friday, Oct. 9, 2015 11:10 a.m.
For the 2015 model year, the Chrysler 200 series underwent a dramatic redesign. For 2016, all model types (the LX, Limited, 200S, and 200C) offer feature and style improvements that make them even more competitive in the popular family mid-size sedan market segment. The 2016 Chrysler 200 sports a smoother, rounded front end finished with a refined grille; the long roofline gives it an elegant, luxurious appearance. The roomy interior is nicely detailed, with sliding cupholders and functional cubbies. A pass-through area in the center console and the flip-down armrest offer storage. All models have a 60/40 split back seat with a trunk pass-through. The Limited version adds alloy wheels and an audio upgrade to the standard A/C, multistage front airbags, keyless entry, LED ambient interior lighting, USB and Bluetooth connectivity, and tilt/telescopic steering wheel. Additional available options for the 200 Limited include packages offering dual-zone climate control, remote start, heated mirrors, and a heated steering wheel. The Convenience package adds an 8-way power adjustable driver seat and a rear backup camera. The 200C focuses on luxury, with an option to select a V6 engine and/or all-wheel-drive. Standard features abound, but options include leather-trimmed seats, power 8-way driver and 6-way passenger seats, heated front seats, and automatic climate control. The available Navigation and Sound package adds a UConnect system with a Drag and Drop Menu Bar, Siri Eyes-Free compatibility, and a ‘Do Not Disturb’ function.